Charles B. 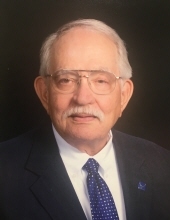 "Chuck" Carsten, 84, died peacefully in his sleep on Monday, January 28, 2019. He was born on August 28, 1934, in Tulsa, OK, to Charles B. and Marianna Carsten. After completing the USAF's Aviation Cadets program, he was assigned to RAF Sculthorpe, England, where he met and married the love of his life, Bobbye Thomas. They returned to the United States, where he went on to graduate from Memphis State University and to play a pioneering role in software development, a career that allowed him and his family to experience the beauty and diversity of America before finally settling in Tupelo. Admired for his compassion, integrity, intelligence, kindness, and sense of humor, Chuck lived a life of gratitude and service to his God, family, and country. A man who enjoyed the privilege of traveling (and playing golf) around the globe, he found his deepest joy at home, surrounded by his family and friends. Chuck is survived by his beloved wife of 61 years, Bobbye; children, Rebecca Hampton (Bill), Elizabeth Langston (Rick), Nancy Barrett (Dennis), James Carsten (Emily); his eleven grandchildren, Kelly Yarbrough (Mike), Emily Marcinowski (Shawn), Beau Carsten (Becky), Ben Carsten, Julianna Langston, Amy Langston, Marianna Barrett, Brent Carsten, Bryce Carsten, Carrie Barrett, and Breely Carsten; and his seven great-grandchildren, Devon, Lily, Abigail, Katie, Bradley, and Matthew Yarbrough, and Emma Jayne Carsten. Also surviving is his adored sister, Lucinda McCoy (Clayton) of Stillwater, OK, and many nieces and nephews. He is preceded in death by his parents and his grandson, Charlie Barrett. The family would like to thank Tammy Smith and Glenda Bolanes for their wonderful care of "Mr. Chuck" in these past few months. A Service of Witness to the Resurrection will be held on Saturday, February 2, at First Presbyterian Church, Tupelo, at 11:00 am with the Rev. Dr. Ron Richardson and the Rev. Dr. Olin McBride officiating. Visitation is at 10:00 am. There will be a private family burial at the St. Thomas Aquinas Cemetery, Saltillo. Waters Funeral Home is assisting the family. In lieu of flowers, the family asks that you make a donation to Charlie's Playhouse Fund (First Presbyterian, Tupelo), the Charles Sebastian Barrett Memorial Scholarship Fund (The University of Mississippi), or the charity of your choice. To plant a tree in memory of Charles Carsten, please visit our Tribute Store. "Email Address" would like to share the life celebration of Charles Carsten. Click on the "link" to go to share a favorite memory or leave a condolence message for the family.